After each difficult Texas basketball loss, like Wednesday’s 54-53 decision to Virginia Commonwealth, there’s always a familiar refrain. The Longhorns need to “trust the process,” as senior Dylan Osetkowski said. By all accounts, this year’s group would run through a brick wall if Shaka Smart asked them. “It’s not like our guys are not trying hard,” the coach said. A lack of urgency, effort, compassion — choose whatever buzz word you like — is not, nor has ever been, the issue. It’s shooting. Texas, having dropped three straight after beating No. 7 North Carolina on Thanksgiving, simply cannot shoot the basketball. Not with any level of consistency, at least. It’s a program-crippling problem. The Longhorns (5-3) shot 41.5 percent against the Rams. That sounds good at first glance. But Smart’s crew was 4-for-17 from 3-point range and missed two wide-open, potentially game-winning shots in the final minute. Courtney Ramey missed from the left wing with 40 seconds left, and Coleman missed one just before the buzzer. Complicating things was Kerwin Roach II, the senior leader, was 1-for-11 overall. This after he went 2-for-12 in last Friday’s stunning loss to Radford. Here’s a sobering thought for Smart: what if it doesn’t get better? What if this team, now shooting a Big 12-worst 40.5 percent for the season, is what it is? Smart seems truly mystified, like everyone who watches this team. These last two losses to Radford and VCU were just as embarrassing as those two non-conference home clunkers against UT-Arlington and Kent State two years ago. But this is different. What’s troubling is that the Horns actually tried to take more mid-range jumpers instead of settling for threes. It still didn’t work. Osetkowski, who didn’t take a single 3-point shot this time, backed one defender all the way into the paint. He finished with seven points and nine rebounds. As for Osetkowski’s dribbling and three turnovers, well, one crisis at a time. Jericho Sims had 14 points on 7-of-9 shooting with a few dunks and low-post buckets. But Kamaka Hepa (2-for-4 overall, all from long range) has yet to do anything more than try 3-pointers. Ramey (0-for-3 overall, all from downtown) does little more than shoot threes. That’s supposed to be Jase Febres’ job. He was 2-for-6 overall against VCU and 1-for-3 from 3-point range. VCU (7-2) didn’t need to attack. Coach Mike Rhoades’ club was content to bomb away and miss, too. 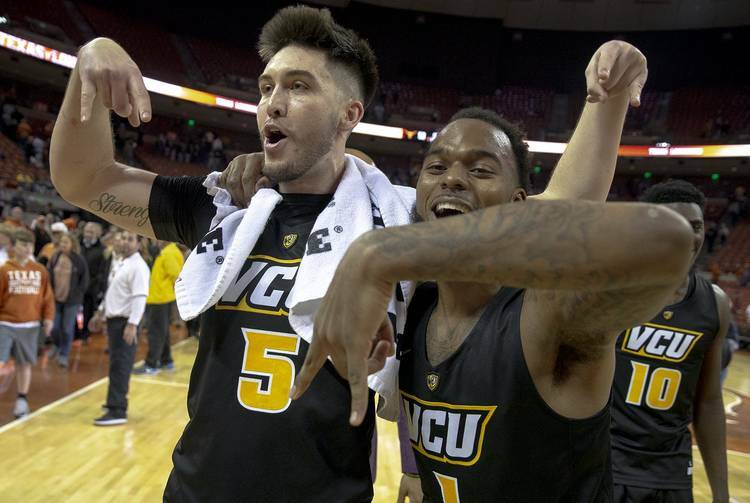 Somehow, VCU shot 28.1 percent overall… and won. Marcus Evans had a game-high 16 points while De’Riante Jenkins added 12 and Issac Vann just snuffed out Roach. VCU’s fans, who showed up in force, could be heard rattling the Erwin Center walls with chants of “V-C-U!” afterward. Smart is four seasons removed from leading VCU’s program but thumping him still carries importance in Richmond. Rhoades called it a “rock fight,” basketball code for a slow, ugly game. The closing stretch sure qualified. Texas had three consecutive turnovers at one point. The Horns were within one with less than four minutes to play. Then, Coleman threw a pass that went straight through Jaxson Hayes’ legs for a turnover. Hayes was called for a charge trying to go over the top of Marcus Santos-Silva. UT’s defense forced a shot-clock violation with 53.3 seconds left. Trailing by one and getting at least two possessions to score should be no problem for a well-schooled college basketball team. For Texas, it’s painful to watch. If things don’t change, it’s downright scary what else might happen. It’s still early December.